There are more than 500 species of shark and only three of them pose a significant threat to humans. These are the great white, bull or Zambezi and tiger shark. The probability of being bitten by a shark is statistically extremely low. There were 72 shark bites, three of them fatal, reported worldwide in 2014. Considering that hundreds of thousands of people use the ocean daily for recreation, this is a staggeringly low number. 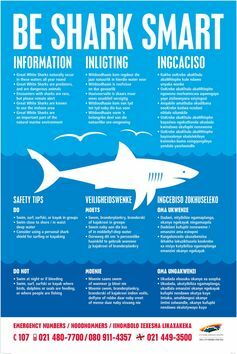 There is a list of shark safety tips to follow that will reduce your individual risk even further. But have you ever wondered where the advice comes from and how to use it? Shark safety advice is geared towards reducing the probability of an encounter between people and large, predatory sharks. There is always a chance of encountering a shark in areas where they occur, but some locations, times and situations are more risky than others. Sharks do not randomly swim around the ocean. They frequently follow specific migration routes, predictable feeding opportunities and are temporarily resident in some areas, either to feed, reproduce or rest. By avoiding times of higher risk one can significantly reduce the likelihood of encountering a shark. The predator-prey relationship between great white sharks and Cape fur seals provides a good case of how effective this can be. At Seal Island, False Bay off the Western Cape coast, over 80% of seals attacked are inexperienced seal pups because they swim in areas and at times of high shark risk. More experienced adult seals avoid these high risk conditions and are rarely attacked. In general, seal colonies and adjacent beaches in South Africa, from Cape Point in the Western Cape to another coastal city Port Elizabeth, are great white shark hotspots. Encountering a shark in these areas is relatively high. River mouths and adjacent beaches in sub-tropical and tropical areas of southern Africa are frequented by bull sharks for feeding and reproduction. In some cases the higher risk may be seasonal, such as in False Bay, where great whites are seasonally more abundant near beaches over summer time. 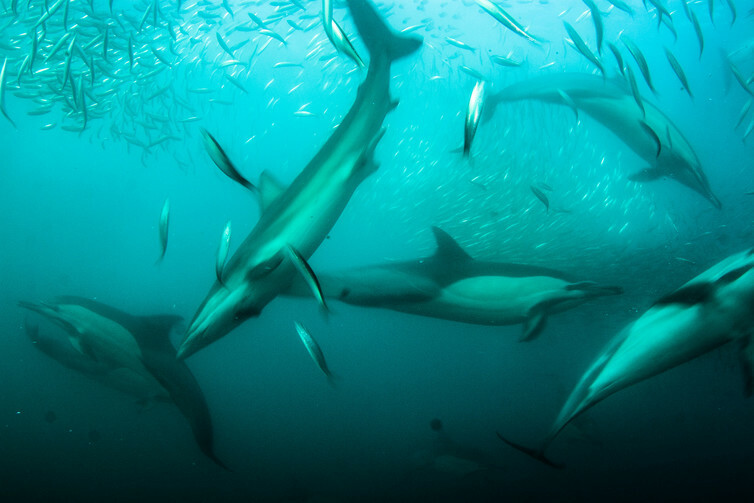 Sometimes higher risk is associated with major events, such as the annual sardine run along the east and KwaZulu Natal coasts when various shark species follow an abundance of fish along the coast. Bull sharks are known to be more active following floods and heavy rains. At a smaller scale, shallower is better. Even though sharks are capable of swimming in very shallow water, most shark activity is in deeper water. Shark Spotters in False Bay record over 70% of great white shark sightings behind the surf zone, in deeper water. Sometimes predicting or identifying risky situations is not possible and on average South Africa experiences four shark bites, two of them fatal, in a year. In some years there are no incidents at all; in others there have been up to eight. Terrestrial predators like lions and leopards use vegetation and topography to ambush their prey. Similarly, large sharks like to hunt near drop-offs, in-between sand banks and on the edge of kelp forests, where they wait to surprise seals, fish or turtles swimming through. Sharks also use low light like dawn and dusk and murky water to hide in, and sneak up on their prey. Sharks have a sensory advantage in these conditions. Sharks, especially bull sharks, are attracted to areas with high sewerage outfalls or other effluents, such as near abattoirs. Fishing harbours, and areas used regularly by fishermen should be avoided, especially when fish catches are high. There are a number of visual cues one can use to identify such high risk times. Diving seabirds and dolphin sightings indicate the presence of bait fish like sardine, anchovy, and herring. Lots of fishermen are a good cue that the fish are biting. The baitfish attracts larger predatory fish and other smaller sharks, which are prey for large sharks. Contrary to popular belief large sharks are not deterred by dolphins. In fact dolphins and large sharks will often feed on the same fish and in some cases dolphins are potential food for large sharks. One of the best pieces of advice is to stay in a group. Sharks are more likely to attack a solitary individual, a group offers extra vigilance to spot an approaching shark and there is someone close by to help in an emergency. Do not enter the water if you are bleeding from an open wound, and enter with caution if you are menstruating. It is unlikely that this will attract sharks from far, but sharks have an acute sense of smell and it may mean you are singled out if a shark is close by. Avoid wearing contrasting colours and shiny jewellery because sharks see contrasting colours very well and the shimmer given off by jewellery resembles the shine of fish scales. This is particularly true for bull sharks in murky water. There are a number of shark deterrents on the market, from magnetic bracelets to wetsuits which mimic sea snakes. Consider using a personal Shark Shield which is an electronic device used to repel sharks. To date this electric shark repellent is the only deterrent on the market which is backed up by independent research. However, its effect is species and behaviour dependent and does not provide a 100% guarantee. Where available choose to use beaches with shark safety strategies, like shark spotters, life guards or exclusion nets in place. If visiting a remote beach, make sure that you have a basic medical first aid kit as well as emergency numbers easily accessible. Bear in mind that each location will be affected differently according to the species present, and its reason for being there, as well as your activity like swimming or surfing. Research your area or contact a local shark scientist for more information. 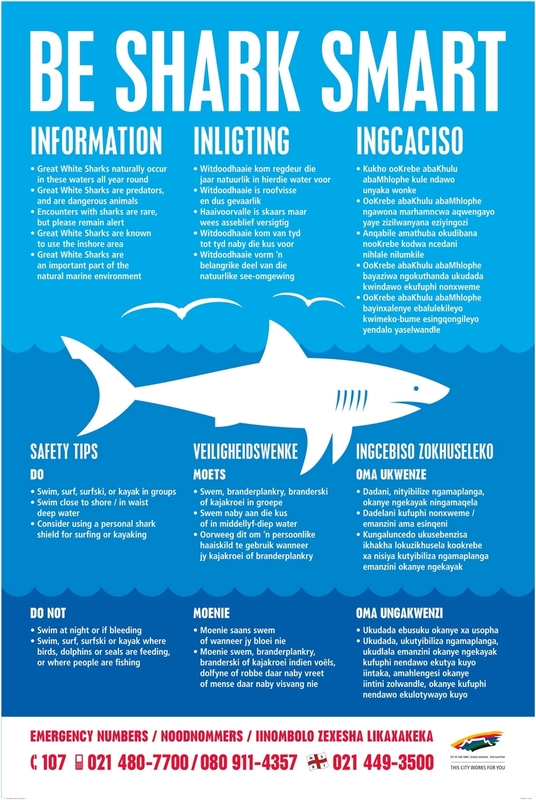 Importantly before heading out into the water again, take a few minutes to ask locals about recent shark sightings and assess the prevailing conditions for any unusual marine activity.